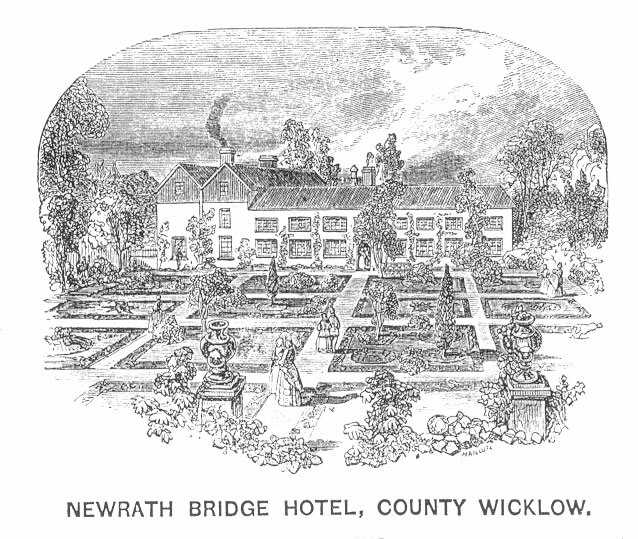 The hotel developed from a forge which was situated by the Vartry river at Newry Bridge in the mid 1600s. This is the Newrath Bridge of today, which originates from the Gaelic,"n-iurrach" meaning ”land of the Yew trees”. There are still two ancient yew trees at the bottom of the hotel gardens by the river. The inn, which was part of the Ballinapark estate of the Tighe (formerly Fownes) family, was operated by a succession of landlords in the 18th century. The Rose family in the 1770s, the Cole family in the 1790s, and the Nolans in the early 1800s. 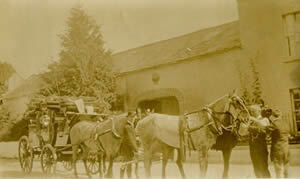 The inn had been serving the old coach road to Dublin for many years when John Hunter, formerly a butler to the Tottenham family at Ballycurry House in nearby Ashford, took over the lease (with his wife Catherine) from the Nolans in c.1825. Eventually the hotel passed from his son Robert to his grand-daughter Sarah Hunter who ran the hotel for many years with the help of her mother Elizabeth and brother Charles Parnell Hunter, a god son and name sake of Charles Stewart Parnell, a frequent visitor. Sarah died aged 91 in 1966. Sarah's sister Francis married Thomas Gelletlie, a watchmaker and jeweller from Wicklow.